Dan Brenner, PhD earned a Bachelor's Degree in psychology from Tufts University and a Master's Degree and Ph.D. in School/Clinical Psychology from Hofstra University. Dan's career started first as a school psychologist and then principal in the Great Neck, New York Public Schools. He later became the high school principal in Yorktown, New York, and an Assistant Superintendent of Curriculum, Instruction, and Technology in the Roslyn, New York Public Schools. Dan spent 8 years as the Superintendent of Schools in Roslyn and moved on to become the Superintendent of Schools in Darien, Connecticut in 2015. The driving force in his career is his philosophy of putting the needs of students first. Dan's belief system is that schools should be rigorous places of learning that inspire curiosity among its students never losing sight of the simple fact that rigor and fun can coexist as partners in the learning process. Salvador Uy is a proud 1983 graduate of UNIS, and the child of UN parents. Before returning to UNIS as Assistant Executive Director in 2012, Sal ran operations and programs for two large New York social service organizations focusing on justice and community. Although trained as an attorney, Sal has spent most of his career prior to UNIS in local government agencies and non-profit organizations. In the late 1990's he was an Assistant Commissioner at the New York Department of Homeless Services, where he managed shelters that housed 3,000 single men and women every night. In the non-profit arena, he also managed family shelter facilities for families fleeing domestic violence and in his last position, as Associate Director for Operations at the Goddard Riverside Community Center, managed housing for 600 single men and women, as well as the infrastructure and operations for the balance of a $35 million multiservice organization. Sal holds an A.B. from Princeton University and a J.D. from Columbia University School of Law. Antoine Delaitre’s personal life, professional experience, and wide range of passions have imbued him with a strong international mindset. HIs lifelong curiosity leads him to travel often to the far reaches of our world. He has lived in Algeria, Greece, France, Gabon, the United States of America and speaks five languages. Prior to joining UNIS in 2015, he held a variety of leadership positions during his 18 years at the French American International School in San Francisco including head of department, IB and travel program coordinator, high school assistant principal, and middle school principal. Antoine holds a Master’s Degree, a Master of Advanced Studies, and the Agrégation in history from the University of Paris. Pascal comes to us from the Lycee Francais in Seoul, Korea, where he was both the Principal of a large Elementary Section and the Regional Director of Academic Technology and Teacher Training for the French Network of Schools in the Asia Pacific Region. Previously Pascal was Head of an International French school in Bali, Indonesia, a technology coordinator in the US, and a teacher in “at risk” schools in France. Pascal speaks French, English, Korean and has a strong international track record for innovation, team-building, and collaboration. Barbara Kennedy joined the Queens campus over 35 years ago. She initially served as the first learning support teacher at the campus, and eventually assumed both learning support and school counseling positions at the campus. She has also served as interim principal and, for the last three years, as assistant principal for the Queens campus. She overseas all testing done at Queens, including admissions testing, which has given her an incredible opportunity: to know every child who comes to school at Queens. Before joining UNIS, Barbara was a middle school math and homeroom teacher at St. Stanislaus Kostka, in Maspeth, NY. Barbara received degrees in Psychology and Education from Queens College. She has a Master’s Degree in Special Education and in School Counseling, both from Hofstra University and has New York State certification in both those areas. In addition she has done graduate work in Educational Administration at Long Island University’s C.W. Post Campus. Barbara’s primary areas of interest are curriculum development and assessment and she has served on numerous curriculum committees at UNIS, including as co-chair of the Curriculum Sub-committee during UNIS’ recent CIS accreditation. Barbara has also attended the Principals’ Training Center, as well as done training for the Common Ground Collaborative (CGC). In addition to her passion for curriculum development, Barbara enjoys spending time with her husband and three grown daughters. Elaine Kelly has worked in the education field for the past 25 years. Before joining UNIS, Elaine taught English and social studies in the United Arab Emirates and in her native Canada. Elaine has a Bachelor of Arts from Mount Saint Vincent University in Halifax, Nova Scotia and a Bachelor of Education degree from Saint Francis Xavier University (St. F.X.) in Antigonish, Nova Scotia. She received her Master of Education in Leadership and Administration from the School of Education at St. F.X., as well. Elaine first joined UNIS as a middle school humanities teacher at the Queens Campus in 2005. In 2007, she moved to the Manhattan Campus to teach humanities and English to middle school students. During her time at UNIS, Elaine has served on a number of different school-wide committees and in a variety of administrative roles. She was a member of the Teaching and Learning Committee from 2011-12, and co-chaired a sub-committee as part of the most recent CIS accreditation visit in 2014. She was a Grade Coordinator for the 7th grade, and Subject Coordinator for Middle School humanities. Elaine was the Middle School Assistant Principal from September 2012-April 2018. During that time, she served as Acting Principal on two separate occasions. Elaine believes in children and the power of learning. She is a student-centered educator who knows a child’s natural curiosity and desire to learn has no limits. Elaine understands that it is the job of educators to nurture and stretch these natural inclinations of their students. She knows it is the job of educational leaders to provide classroom educators with the supports they need to create learning environments in which students can successfully pursue creative and intellectually rewarding learning experiences, and she is committed to that work. John Nichols grew up in the United States and England, and received his A.B at Harvard, where he majored in English Literature. After law school at Boston University, he worked for a law firm in Washington, D.C., and then began teaching, first at Harvard, then at Eton College in England. For fourteen years, he was the Dean of Students at Trinity School in New York, and then worked for the president of New York University, with the goal of starting a tuition-free private school in New York. He was then Dean of Admissions and Academic Dean at the Baltimore School for the Arts, a pre-professional arts high school. He became Director of Admissions at UNIS in May 2012. His favorite activities are traveling, going to the theater, and playing squash (even though his game hasn't improved at all in many years!). Susan Enzer is the Executive Assistant to the school’s Executive Director and a dedicated member of the UNIS family from the time her sons attended Junior and Middle school from 1985 until 1996. During those years, Susan served as Parents Association President as well as a parent-elected Trustee on the UNIS Board. She joined the Director’s office in 2010 having spent most of her career as a Marketing Communications Director in financial services. Susan is an officer of a local political club for her assembly district, a member of the New York County Committee and a delegate to the Judicial Nominating Committee. Susan has spent time as a volunteer for Juvenile Diabetes Research Foundation in New York City and served on the board of Art OMI in Ghent, NY. She is founder of a book club that meets monthly since 2005 for discussion and dinner. Susan also enjoys theatre, ballet and the feast that is New York. Susan holds a B.A. in Literature from Hofstra University and has done graduate studies in suburban planning and marketing. She is also a certified paralegal. Duncan has worked as a teacher, coach and educational leader for the past 25 years in a variety of educational and sporting organizations. In his current role as the Director of Athletics & Sport and Physical Education at the United Nations International school, he is responsible for the leadership of 36 sports teams and over 40 coaches across both the Manhattan and Queens campuses and for the leadership of the PK-12 P.E curriculum. 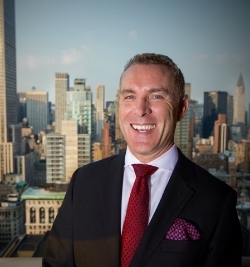 Duncan earned his Masters degree from Sydney University and has worked in leadership roles with education, corporate and non-profit sectors in Australia and the US.